Two years ago, in March 2016, the newly-opened Helsinki office wondered about the expressivity of our current product data. What do attributes like material construction or sport quality really mean, and how can we use them to create meaningful fashion experiences online for our customers? It was around that time that, after working for five years solely in the art sector and building digital strategies for various classical music organisations, I applied for Zalando in hopes of improving my existing technology skills and perhaps learn some Scala. It quickly became apparent that what the company and teams in Helsinki actually needed, was a technical solution for better fashion understanding. In order to innovate the online shopping experience, we need to be fluent in fashion, and for that we need background information. We need to be able to know, for example, what vegan clothes are. While product data does express whether the item is made of wool or leather, etc., nowhere is it explicitly expressed that the absence of these materials equals “vegan.” So how can we, and the customer, know this? So, I gave the Scala course a pause and dove into building a fashion knowledge graph for Zalando using Turtle, JSON-LD and Python. Silk and wool are animal-based fibers and leather is an animal-based material. Vegan means refusing to use any animal-based products. Therefore, an application using the knowledge graph can interpret the product data of wool, silk, or leather as not suitable for vegans, or only offer products that are vegan by excluding those items with materials made from animals. Show a page with knowledge about vegan clothing that includes articles on vegan fashion, outfits for vegans, vegan clothing collections, and vegan-appropriate products from our catalogue. Intelligently suggest links for further browsing. Apply business rules. For example, when a customer is browsing a particular brand, we might not suggest competing brands. Know which attributes are complementary to each other and which ones are opposites of each other. 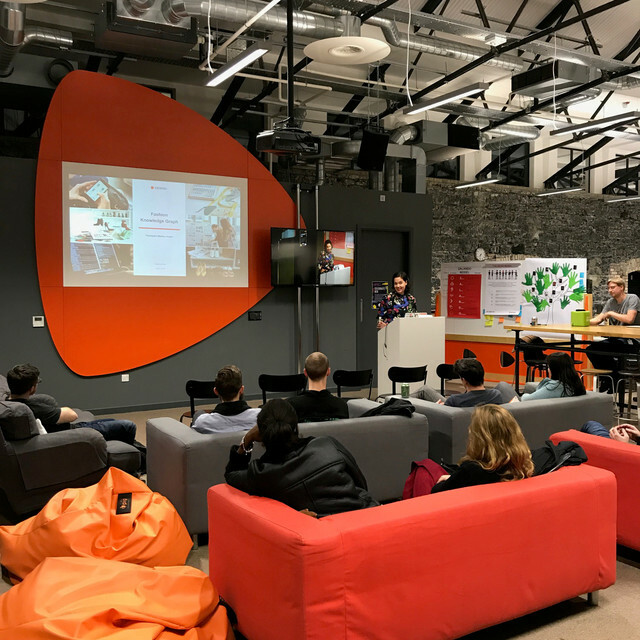 Katariina presents her work in our Dublin tech hub. Many times semantic web is either overlooked or confused with machine learning (ML). Artificial intelligence nowadays is mostly a synonym for machine learning. However, semantic web is a branch of artificial intelligence that is very different from machine learning. Typically, when I state my profession as a semantic web practitioner, I hear what most of my colleagues hear: “But Machine Learning does it better!” I agree with better to some extent, but I am not so sure about the it. ML does many things better; things semantic web technologies are not really good at. Different learning algorithms are great at finding and recognising patterns in large data sets. A knowledge graph does not really do that. What it is good at, is providing additional human knowledge to what has been learned or could be learned. Recently, there have been numerous expert discussions on the explainability of machine learning methods, and more general discussions about making machine learning processes less opaque. Deep-learning methods are statistical models based on neural networks that fit to large datasets and learn layers of so called "weights," or numeric parameters. They produce highly complex and functional black boxes that work, but cannot really answer why they work. Further research explores how to add ontology information to the learning structure and thus to explain what has been learned. I find this research exciting, because I think we can get the best results by combining both approaches. Years ago I co-wrote a paper on how a classic machine learning application of document classification based on word-to-vector could be improved by few percentage points when adding information from a general-domain knowledge graph. Therefore, I have found the sentence “But Machine Learning does it better!” too dualistic for comparing two very different branches of artificial intelligence. It is like saying that “fish tastes better!” when I express my liking to Béarnaise sauce. I have one more thought I would like to share that I have developed over the years I have worked with the arts. Much like any artistic endeavour, fashion seeks to find new and unusual combinations. It seeks to break the status quo and to shock us in just the right way. Trends love contradicting each other. At some point pink and red do not go together ever, at another point in time it is a total trend. Machine learning can only do recommendations based on existing data. With the knowledge graph however, we can ask for fashion experts to give us these glances to the future, describe the self-contradicting world that fashion is, and help us present our contents to our customers in a meaningful way. Want to change the fashion landscape like Katariina? Check out our Helsinki job postings.